Even if you're keeping a close eye on his water bottle, it's hard to tell whether your guinea pig is drinking enough on a daily basis. If he's not drinking properly, you might see signs of dehydration -- but only if you pay close attention. Guinea pigs are good at hiding health problems; you might need to play detective to discover what's going on. 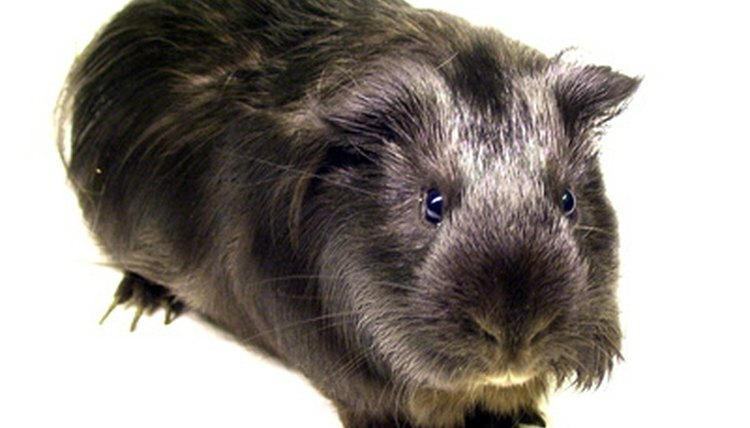 Check your guinea pig's urine. Dark, strong-smelling urine is often a sign of dehydration. When your guinea pig is drinking normally, his urine will be lighter in color. Pinch the skin and see how fast it returns to its natural position. According to the Merck Manual for Pet Health, "skin tenting" is a sign of dehydration. This is what happens when you pinch the skin and it stays up -- like a tent -- for a few seconds, rather than bouncing back to its starting point immediately. Look at the form and consistency of the guinea pig's stool. According to the Guinea Lynx Care Guide, teardrop-shaped droppings signify dehydration. When your furry one is dehydrated, you might notice dry stool or droppings smaller than usual, too. Look at your piggy's eyes. If they look sunken and lackluster, this could indicate dehydration. Guinea pigs are usually alert, always looking around to keep up with what's going on. If the eyes lack liveliness, fatigue may be causing dehydration. ⚠ See your veterinarian any time a concern arises about your pet. Guinea Lynx Care Guide: What's Normal? What's Not?